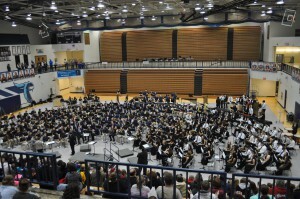 On Thursday, January 21, the sound of nearly 400 band students filled the main gymnasium at Perry Meridian High School as the 3rd Annual Band-O-Rama began. Band students from Perry Meridian 6th Grade Academy, Perry Meridian Middle School and Perry Meridian High School (grades 6-12) were assembled. The evening began with a special guest performance by the Indianapolis Brass Choir, under the direction of Mr. Darin Sorley. The theme of the evening was “Band as Life Long Learning. The PM Bands then performed in 5 separate groups, followed by a mass band grand finale performance. Under the capable conducting of Mr. Andrew Wilson, Mr. Kenneth Belt and Mr. Alan Slightom, the mass band performed “And The Morning Light Was Shining Bright” by Rick Kirby. Congratulations to all the band students and their directors on an amazing performance.